As a result of a sterling July MLS® performance, year-to-date dollar volume is now ahead of last year’s with both years being the first ones to reach and go over $2 billion in seven months’ time. Without listings you cannot have sales and July was exceptional in seeing more than 2,000 new listings come on the market. This level of listings is more typical of a spring month. Given how 2013 saw delayed spring market activity due to a prolonged winter we may well be in catch up mode in July. July MLS® unit sales increased 13% (1,388/1,225) while dollar volume rose 20% ($352.8 million/$294.4 million) in comparison to the same month last year. Year-to-date MLS® unit sales are down 4% (7,819/8,146) while dollar volume is up less than 2% ($2.03 billion/$2.00 billion) in comparison to the same period last year. The inventory of 3,908 active MLS® listings at the end of July is up 16% over 2012. July residential-detached or single family home sales ended a five month losing streak in falling short of last year’s same month sales activity with a 10% increase. 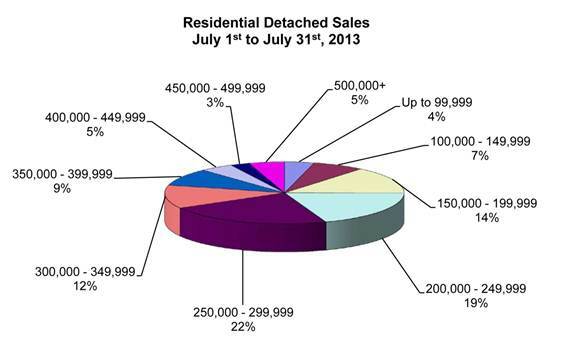 On the other hand, condominium sales continue to impress with a 38% jump over July 2012. You only have to go back to 2005 when condominium sales for the entire year are slightly less than the 1,042 sales recorded thus far this year. 2004 had less than 1,000 condominium sales. If you were to give out a gold star to an MLS® area that is seeing the highest conversion of all its listings to sales it is Valley Gardens in northeast Winnipeg. All of its listings sold in the first seven months. Only one off that achievement is Waverley Heights (not far from the new stadium). The most active residential-detached price range in July was from $250,000 to $299,999 at 22% of total sales followed by $200,000 to $249,999 at 19%. A huge disparity in the highest and lowest residential-detached sale was readily apparent with a $1,180,000 and a $17,500 sale respectively. Condominium sales while highest again from $150,000 to $199,999 at 29% had the $200,000 to $249,999 price range nipping at its heels with 26% of total condominium sales. The average days on market for residential-detached sales was 32 days, 10 days off the pace set last month and six days behind July 2012. The average days on market for condominium sales was 33 days, 8 days quicker than last month and July 2012.